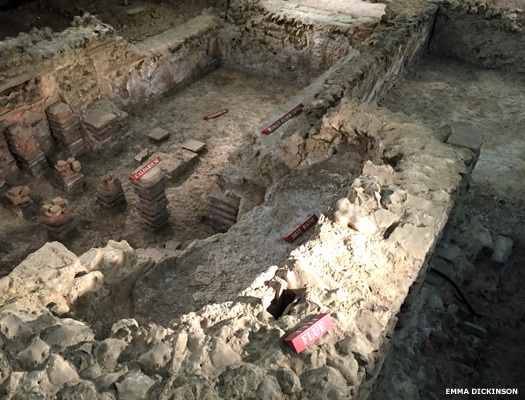 In the south-western corner of the Trinovantes tribal territory, the city of London in its earliest form was founded as a settlement perhaps by circa 500 BC, and it was this small settlement that was probably used as the basis for the later Roman city. Legendarily at least, its name seems to stem from Llud Llaw Ereint, traditionally the founder of Gwynedd and high king of Britain, in the form of 'Lud Dun', or Llud's fort or settlement. Going back even further in traditional terms, the city was first founded by Brutus, first high king of Britain, and was originally named New Troy. Edward Dawson concurs that the Trinovantes name spelled with a 'v' sound should be accurate. In Latin the 'v' was originally pronounced as it appeared, but it softened in time to a 'w'. Once that had occurred, Latin speakers from Italy would probably write 'Trinobantes', while Roman citizens of Celtic provinces might continue using 'Trinovantes'. The name breaks down into 'tri-' ('three'), plus 'novos' (cognate with the Latin 'novus', 'new', plus a suffix that is unfamiliar. Note that the word Trinovantes is directly related to the name of a tribe in the southern highlands of Scotland, the Novantes, with just the 'tri-' prefix removed. No connection between the two tribes is known, but the similarity does suggest a similar origin or naming concept. No written records exist to detail any but the last of the tribe's rulers, whose names were recorded by the Romans. Pronunciation of the tribe's name is straightforward enough, breaking down into four segments - trin-o-van-teeze - and with a mild emphasis on the emboldened letters. One thing to remember is that if a Roman recorded a name, a 'v' is pronounced as a 'w', although this seems largely to be ignored with the Trinovantes. During the first of his expeditions to Britain, Julius Caesar regards the Trinovantes as perhaps the strongest tribe in the region. Despite this strength, the Trinovantes may be one of only two tribes to obey Caesar's command to send him tribute and hostages after his departure. Killed by Cassivellaunus of the Catuvellauni. Imanuentius' successor, Mandubracius, is exiled from Britain by High King Cassivellaunus, king of the Catuvellauni. He goes to Julius Caesar in Gaul and wins support. When Caesar makes the second of his exploratory forays into Britain, the Trinovantes reveal the location of the main Catuvellauni stronghold, which is then besieged by the Romans. Mandubracius is reinstated following the Roman victories over Cassivellaunus, and the high king is ordered not to make war against the Trinovantes again (Mandubracius is claimed as a son of High King Lludd Llaw Ereint, but due to copying errors he is called Androgeus). Son. His daughter married the unnamed king of the Catuvellauni. Name unknown, and may not even have existed. The next identifiable ruler after Mandubracius is Addedomaros, but nothing is known of any connection between the two. Indeed, it is not even known for sure whether they rule concomitantly. Some sources state that Addedomaros begins to rule the tribe between about 20-15 BC, indicating the possibility of at least one king whose name has been lost. Others place the start of Addedomaros' reign at about 30 BC. Subservient to the Catuvellauni? Reigned for about 10 years. Almost as soon as he succeeds to the Trinovante throne, Addedomaros (or Addedumaros, or even Addedmaros) moves the capital from Braughing (now in Hertfordshire) at the eastern headwaters of the River Lea (the tribe's westernmost border), relocating it at a new site named 'the fort of the war god Camulos' - Camulodunum. According to Edward Dawson, the name Addedomaros appears to mean 'one with the ocean' (addo addere addidi additum: to add or join, plus 'maros', the sea). This king's economic influence spreads far and wide. His coins are later found by archaeologists across Northamptonshire with finds as far west as Evenley and Flore in that area. 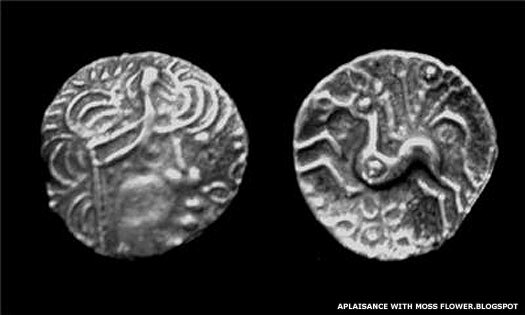 With deposits of Dobunnic coins in these areas as well, coupled with the identification of early east-west trading routes, there is strong evidence of intra-Catuvellauni/Dobunnic trade in Britain. A series of coins are issued by Tasciovanus of the Catuvellauni with a mint mark that shows they are produced in Camulodunum, the Trinovante capital. Tasciovanus later claims to be the rightful heir of the kingship of the Trinovantes, suggesting a possible family connection to Mandubracius. Tasciovanus is soon forced to withdraw, perhaps by pressure from Rome, restoring the Trinovantes to full independence. Curiously, this appears to be about the same time at which Dumnovellaunos also seems to become king of the Cantii. Does he conquer the tribe himself or is he placed in command of it by his possible overlord, Tasciovanus? Son. Also king of the Cantii (15 BC-AD 5). Claimed as High King. Dumnovellaunos apparently travels to Rome where he pays tribute to Caesar Augustus (recorded in the Res Gestae), showing that the Trinovantes and Cantii seem to maintain links with the Romans that had been established by Julius Caesar. Known from coin evidence only. Diras is an obscure individual who is known to hold power north of the Thames around this time. He could be a successor to Dumnovellaunos (whether legitimate or a usurper), but scholars cannot even be sure whether he is of the Trinovantes or the Catuvellauni. In 2003-2006, a hoard of coins is uncovered by degrees in a field in Kent, comprising mostly of coins minted by the Cantii. One coin, buried along with the rest in the first century AD, carries Diras' name. The Trinovantes appear to be defeated in war by the Catuvellauni, probably between AD 5-9. The most likely date is AD 9, immediately following the decimation of three Roman legions in the Teutoberger Forest by the Cherusci. After this, the Catuvellauni prince, Cunobelinus, seems to rule the subject Trinovantes as a sub-kingdom from their capital at Colchester until he succeeds as king of the Catuvellauni. The Trinovantes do not regain their independence. High King. Became king of the Catuvellauni in AD 10. The succession appears to be uncertain for this period. Togodumnus, son of Cunobelinus, rules the Catuvellauni, but not necessarily the Trinovantes. His brother, Adminius of the Cantii, is expelled from the country around AD 39 or 40, and is not known to return, but the basis for the expulsion may relate to a power-grab by Togodumnus and another brother, Caratacus. The Trinovantes are conquered by the invading Romans under Governor Aulus Plautius and Emperor Claudius himself as their Catuvellauni overlords are defeated and pushed out of the east coast. 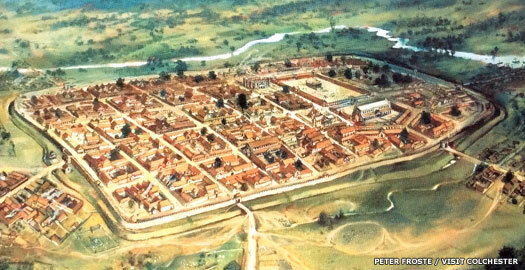 Camulodunum (modern Colchester) becomes the Roman capital until AD 61. Once Prasutagus of the Iceni dies, the Romans begin to ignore the terms of the Iceni's client-statehood, while the Trinovantes may be bearing a grudge because their tribal lands have not been returned to them following the defeat of the Catuvellauni. Stirred up by imperial heavy-handedness, Boudicca leads a powerful Celtic uprising involving the Iceni, the Trinovantes and other tribes. It results in the loss to the Romans of lower eastern Britain. After sacking and burning Camulodunum, Londinium, and Verulamium (St Albans), the Celts are confronted by a fresh Roman army under Governor Gaius Suetonius Paulinus and are defeated. Boudicca's fate is unknown, but it is presumed that she commits suicide rather than allow herself to fall into Roman hands. The Trinovantes are fully subdued and absorbed within Roman Britain. 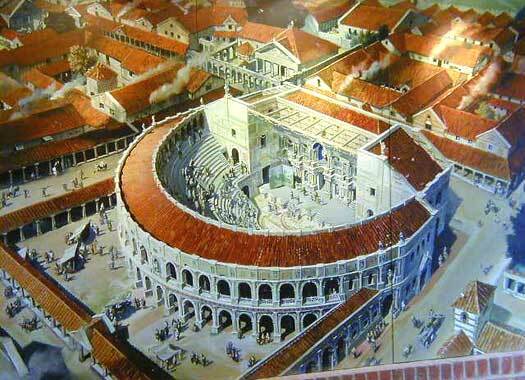 In 2005, archaeologists discover the only known example in Britain of a stadium, or circus, used for chariot racing. It is typically hairpin-shaped, and consists of a track running down both sides of a central barrier (spina). Banks of seats run all the way round, except at one end where the starting gates are located. Probably built in the first century, the outer walls are massive. 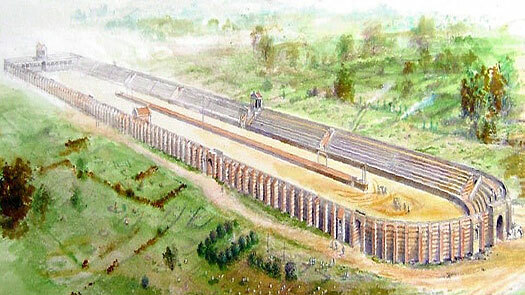 At 250 metres (820 feet) in length it is the largest known Roman public building in the country. It remains in use until it is demolished in the late fourth century. The name of the Roman town is uncertain. A second century inscription refers to 'colonia Victricensis which is at Camulodunum', making a clear distinction between the Roman colony and the Iron Age fortress. It has been suggested that the official name had initially been Colonia Claudia, and that the colony had been renamed Colonia Victricensis during rebuilding after its destruction by Boudicca's followers. Later the town seems to have become known simply as Colonia. Coastal raids by barbarians have developed into a serious problem. Archaeological finds for this period show a layer of destruction along a great deal of the North Sea and Atlantic coast of Europe, between Belgica and southern Gaul, and in eastern Britain, well inside the territory of the Trinovantes. The Chauci are prime suspects for the raids, and Rome responds with improved defensive measures over the following thirty years or so. Fortifications are put in place at sites including the Iceni civitas of Venta Icenorum (modern Caistor-by-Norwich), the Trinovantes town of Caesaromagus (modern Chelmsford), and the civitas of the Canninefates, Forum Hadriani (modern Voorburg). This is the start of the system that will develop into the Saxon Shore in Britain. The threat of Saxon raids along the east coast appears to become serious in this period. Major improvements are made to the coastal defences in south-eastern Britain as a result. Two forts in the system, Bradwell-on-Sea and Walton Castle (in Suffolk) are near Colchester and probably belong to the second half of this period. Colchester lies less than sixteen kilometres (ten miles) from the coast and, although protected to an extent by those two forts, is still vulnerable to sea-borne raiders, especially via the mouth of the River Colne. Three coin hoards from the Colchester area, all dating to about 275, attest to the widespread feeling of insecurity at the time. Steps are taken to improve the town's defences. Initially the town ditch is substantially widened and a counterscarp bank is formed with the soil dug from it. Before the end of the century sterner measures have to be taken. The Balkerne Gate is closed when the town ditch is extended to cross in front of it, and traffic is diverted, probably through Head Gate. The smaller Duncan's Gate, in the north-east part of the town, may also be closed off by continuing the town ditch across its front. The town's built-up area is shrinking at the same time. The change is at its most obvious in the extramural areas outside the Balkerne Gate and North Gate, where practically all the suburban buildings are demolished during the period 275-300, presumably as they occupy exposed positions. Most inhumations are now closer to the walls than most of the earlier cremations. Following the expulsion of Roman administration from Britain, the Trinovantes appear to have retained their identity to some extent, although their former territory was fractured. Their tribal name does not seem to have survived, but in the few written records available this seems to have been typical of the south of Britain. Most post-Roman states appear to revolve around former Roman cities, and often bear their names except in the more lightly Romanised far west. A possible successor kingdom to the eastern section of the Trinovantes tribal territory seems to have formed around the important sub-Roman town of Caer Colun (Roman Camulodunum, modern Colchester - shown below in emboldened red in order to highlight it where necessary: Caer Colun). The town's walls had been erected in the first century, following Boudicca's revolt, a very early date for a walled Roman town in Britain. Various gates and external forts had been erected in the time since then. Following the boom time of the second century, shrinkage had occurred during the difficult years of the late third century and part of the town had been cleared for agriculture, so it was a well-defended and self-reliant location. It apparently held out against the Saxon tide until the mid-sixth century - quite an achievement on Britain's east coast. Whether it also controlled Londinium is unknown, but the city appears to have been largely abandoned from around AD 457, following the final defeat of British forces in Kent. The name Caer Colun probably originated as Colonia Castra, indicating its status as a former Roman colony. In the past it has been traditional to link the name to the River Colne, but which name came first is still the subject of debate. Given the fact there there were multiple 'colonia' towns (Cologne, for example), there may well have been a second Caer Colun in Britain (or a variation, one which depended upon its location and the local dialect). If, as seems less likely, Caer Colun originated in Camulodunum then the route is more complicated. The Brythonic name would be Camulodun (the -um suffix is Roman), meaning 'fort of [the deity] Camulos'. Over the course of time the 'm' transitioned to a 'v', and 'dun' was replaced by the Latin 'castra', forming a probable Roman-era intermediate name of Castra Cavelo (perhaps pronounced Kastra Kavelo by local Britons). The 'castra' was soon replaced with the Brythonic 'caer', and this was replaced by the Saxons with 'chester' (only at the end of the name instead of the beginning), hence modern Colchester. One odd thing about the name Camelodun is that the modifier precedes the noun. This is the Germanic, and proto-Indo-European, word order, and not the Latin and Celtic word order where the noun comes first, before the modifiers. Why this is so is unclear. Also, intriguingly, Camelodun is a perfect match for 'Camelot', and yet this treats the 'm' to 'v' shift as not occurring. The only conclusion that can be drawn here is that, if Camelot is named after Camelodun, then it was called Camelot at a location in which the shift failed to occur, such as Gaul. Even Irish Gaelic had a similar shift - of 'm' to 'w' - around the same time, at the end of the Roman era, so was there anywhere in the British Isles that refused to accept this shift until after the name Camelot was formed? A little way to the north of Londinium is Verulamium, which later writers named Caer Mincip or Mincipit (modern St Albans is located alongside the ruins of the Roman city - the text below shows Caer Mincip in emboldened green). This appears to have formed a British enclave which survived against the odds until around the start of the seventh century, possibly allied with nearby Cynwidion. The name Caer Mincip was derived from the word for fort or citadel, 'caer', and 'mincip' from municipium, derived from the Latin verb 'munio', meaning to fortify, defend, protect. Modern English has derivatives such as municipal, municipality, etc. So while later Britons remembered Verulamium as Caer Mincip in their writings, the sub-Roman Britons who actually inhabited it under increasing threat of conquest by the invaders probably called it Caer Minicipium, the 'defended fort'. The drains around the forum in Verulamium (Caer Mincip) have been well-maintained even during the years of decline in the later fourth century, but in the fifth century they become clogged. Either the forum has fallen out of use or the manpower or will for such maintenance work has died out. Around the same time (at the end of the 300s) the mid-second century theatre in the city, which had been substantially enlarged around 300, is now in ruins, made redundant by the collapse of paganism in Christian Britain and the abandonment of the temple precinct with which it had been associated. Instead it is a rubbish dump. With Constantine III now in serious difficulties in Gaul, further Saxon raids convince the Britons and Armoricans to rebel and expel Roman officials, thereby breaking ties with Rome that are never renewed. Roman presence in Britain has been dwindling anyway for at least the previous three decades, so the split probably produces little change, except that British officials now occupy former imperial posts. Records from this point become extremely sparse and British control on a national level appears to break down for a time. A small hoard of clipped silver coins from Caer Colun provides evidence of this, and the local councils, the civitates, have to take steps to provide for their own defence. The hoard belongs to a rash of groups of clipped coins which appear in Britain in this period. Apparently the clipping of coins has until now been controlled by the imposition of severe penalties on offenders, but with the break from Rome the practice becomes commonplace. By AD 500, the British of Caer Colun seem in some way to be subduing or holding off the new East Saxon settlers, as shown by the lack of Anglo-Saxon relics in the area from this date. This surviving pocket of British power may last until the mid-500s. Very little fighting seems to take place in the territory, suggesting some kind of peaceful arrangement is reached, at least initially. There are signs, however, that Caer Colun's population is declining and traditional customs may be declining too. Two decapitated burials from the grounds of East Hill House may belong to the period since, contrary to normal practice, they are inside the walls. Signs of a city living in an ever-shrinking world, perhaps? Some Late Roman houses in Stockwell Street show signs of remaining occupied into this period, whilst the find of an elaborate Germanic buckle could be evidence of laeti, mercenaries who help to defend the town. Such a potential occupation by foreigners at a time in which the city is still in British hands is entirely acceptable. The same situation can be found in Caer Gwinntguic, with Germanic laeti who are settled to defend the town in the fourth or early fifth century becoming part of the later defensive efforts. The Cantware appear to be the invaders to lead the 'fight' against the British at Caer Colun, perhaps as part of a new wave of more aggressive territorial expansion. The defenders finally capitulate around this time, allowing a kingdom of the East Seaxe to be forged. In fact, it is quite possible that the kingdom of the invaders is pronounced while they are still fighting the Britons of Caer Colun. By this stage it is almost certain that a large swathe of the coastal area has already been taken out of British control. The end for Caer Colun may not be a peaceful one, although there is no knowing whether a surrender is accepted without further violence, The town's Duncan Gate appears to have been subjected to violent action on two occasions - both taking place after the gate had been sealed up around AD 300. The first is no earlier than AD 367 but whether setting fire to the gates at this time had been intended or is accidental is unknown. The second burning of the gates is part of an assault that happens 'substantially later', although the archaeological evidence for it, uncovered in 1927-29, cannot be reassessed. Brushwood is piled up against the outer face of the wooden doors and is set alight, causing the doors to collapse inwards. The heat is so intense that many gate stones turn red. The debris from the fire is apparently not cleared away, implying that the gate is never repaired. If the interpretation of the excavation is correct, then the gate may provide proof of a violent end to the Romano-British administration here. Farther west than the isolated Caer Colun, the town of Caer Mincip (Roman Verulamium, modern St Albans) shows plenty of evidence for the survival of a British enclave. The town is located between the territory of the Middel Seaxe (immediately north and west of Londinium) and the Icknield Way. Its survival may be the last gasp of Trinovantes independence, although it had actually been founded as the capital of the Catuvellauni. A late Roman building has been converted into a barn or granary by the application of huge buttressed foundations. Corn dryers have been inserted inside the building so that such agricultural work can take place within the safety of the town walls. A wooden water pipe is later constructed across the site and is maintained, quite possibly until the collapse of the enclave at the end of the sixth century. This date of Caer Mincip's collapse is very close to that of Cynwidion's collapse, and that territory lies to the immediate north of Caer Mincip. It seems likely that, in its final days, Caer Mincip is an outpost or appendage of Cynwidion, and perhaps a final survivor of the postulated Caer Lundein territory before that. That it has survived at all is probably due to the weakened state of all the southern Saxon kingdoms after their Mons Badonicus defeat around 496. Lundein (Londinium, modern London) is taken by the East Seaxe.